From 11 to 17 March has been a trip to Guinea-Bissau promoted by Humana on the participation of representatives of municipal corporations Alboraya, of Valencia, Amposta, Calafell, Cerdanyola del Vallès, Mollerussa and Sant Cugat del Vallès, of Catalonia, and Santa Pola, Alicante. The purpose of this trip was to show the councilors and technical cooperation projects that Humana and its local partner, ADPP Guinea-Bissau are taking place in the country. The projects are made possible by citizen participation through donations of clothing and footwear in Spain, including municipalities. The expedition visited Bissora Vocational School, where they could learn about new disciplines that are being developed to improve access to the labor market. They also visited the proposed Farmers' Club, in Oio involving 2,000 farmers improve their techniques of food production while improving nutrition and economic resources of the population. 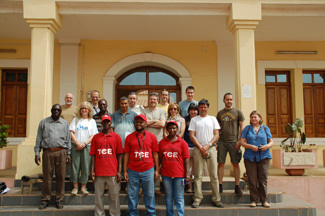 Finally, the expedition moved to the school of teacher education stream have recently opened and visited the ECA Project AIDS in the region of Gabu. 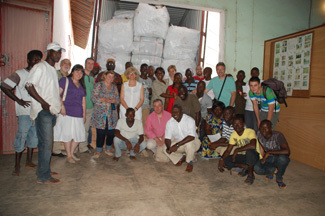 The group met the center's facilities ADPP Guinea-Bissau where used clothing is received from the central Human classification in Spain. Finally, went to a reception at the Embassy of Spain in the capital, were received by the President in office, by the Mayor of Bissau and the UN headquarters in Bissau by the Resident Representative of UNICEF in the country. This trip is part of the Education Project "YES, Cooperation Works," which includes a similar trip to Cabo Delgado, Mozambique, to be held in May, and with the participation of representatives of several municipalities collaborators Madrid and Andalusia.